Six DVD Series featuring Dr. Ergun Caner, Dr. Emir Caner, Kamal Saleem, and Lt. General Jerry Boykin. Twenty programs featuring former Muslims who share the differences between Islam and Christianity, the treatment of women in traditional Muslim culture and the threat Islam poses in America and around the world. 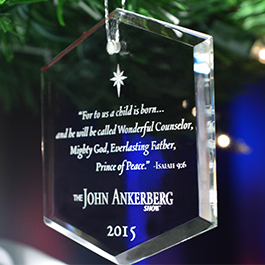 As a thank you for your gift, you will also receive the 2015 JA Show Christmas Ornament featuring Isaiah 9:6: "For unto us a child is born..."
Dr. Ankerberg interviews Drs. Emir and Ergun Caner regarding the human rights tragedies and oppressive treatment of women in traditional Muslim culture. Discover how Muslim teachings compare with the Bible’s high view of women and the need for Christians to stand as a voice to help women trapped behind the veil of Islam. Media continues to echo the idea that Islam is a religion of peace. Is it? Join Dr. Ankerberg as he investigates this question with top experts on Islam and national security. You'll discover answers to: Is Muhammad the ideal example all Muslims are to follow? What does the Qur'an and the Hadith teach regarding violence? Is Sharia Law dangerous for society? You'll find a wealth of information and inspiring testimonies in these three important programs. Join Dr. Ankerberg as he interviews a top expert in counterterrorism and two former Sunni Muslims on Islam's threat to America and Europe. You'' learn about the Muslim Brotherhood's infiltration of American government, education, finance, media, and religion, along with ways you can make a difference with the Gospel in the lives of Muslims in your community. What evidence persuaded the Caner brothers that Jesus was more than a prophet? When Muslims worship Allah, are they worshiping a completely different god than the God of the Bible? For those in Islam, why is there no guarantee of Heaven? Why does Jesus Christ far exceed Mohammed's life in integrity, grace, and wisdom? Is holy war sanctioned by the Qur'an and the Hadith? Islamic law and belief is based on the five Pillars of Islam, which are non-negotiable and not to be questioned. What are they? What do Muslims believe they must do to go to Heaven? What is the only act they can do that will guarantee they will be admitted into Paradise?